That's not good Darren. I had visions of the same problem, not that the parts are worth much but trying to replace them would be a headache. They had every piece of trim from the roof so all handles, lining, sunroof shade and sun visors. Astra Dan has given me a recommendation so I will give them a call, I should have used them in the first place but they are a good 3 to 4 hour drive each way from me. Ron is a good chap and has produced consistently good results. I have tried to speak to Ron, his number on his website, is this still his current number? It goes straight to voicemail? Had bad vibration through the steering wheel, had the tracking set and wheels balanced and all fine, two days later its back. On removing the front wheels I noticed the amount of stick on weights needed to balance the fronts and speaking to my mechanic he said about how difficult it was to balance them. At the moment I have all wheels off and they are with the mechanic so look at. I have the 5 on the car and including spare and a spare 5 of the Cav sri wheels, his task is to check them all, reject any buckled and damaged ones and find the best 4, I'll them get them refurbished. In doing all of this it got me thinking about alloys, I've been running the Cav SRi fanblades since '98. Not sure if I should stay with these, assuming I have 4 straight ones, or swap. This is how it looks now, I have always thought about champion, or expression wheels however I'm running Vectra V6 discs and calipers, the fanblades only just clear the calipers and I'm sure champion wheels don't fit but think expressions are bigger. but don't know where i'd find any or what the car would be like on 17s. Nice car and nice story. 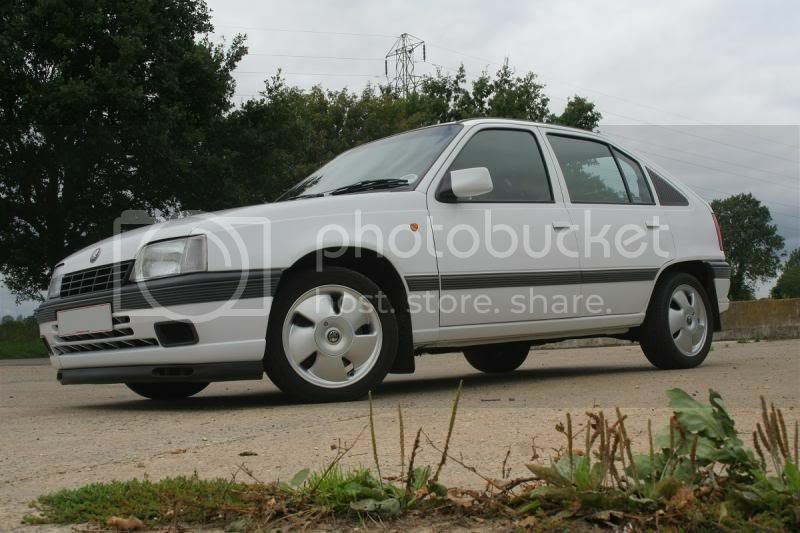 I would keep the fan blades, as I think a 'closed' rim fits the mk2 Astra very well. Most of the original wheel options are designed like this. fan blades look pretty good, at a glance they look like mk2 CD alloys. i think they suit, but depends if you can get a good set together. Last edited by DarrenH; 17-11-2018, 03:46 PM. Astra G SXi wheels are 4-stud too (either 15" or 16", I forget which), although I'm not sure how well they'd suit a Mk2. I did always like the Mk2 CD wheels myself too. 1991 Astra Mk3 1.4LSi "The Shed"
To update I have 6 good wheels out of my 10 and i'm a lot happier with how it drives, not happy with the condition of the alloys though. I am almost sure i'll keep these and get them refurbished in the spring. To me it looks right with them on and although I like the look of some other options I like these as having a period and almost standard look. As a general update as it's been well over a year. Headlining was flocked in anthracite along with sun visors, handles, sunroof shade, etc. It's transformed it and doesn't seem to be any darker in there. Ron done a great job and is a really nice chap too. Only done 2.5k this year, now about to be parked up for the winter. It's done daily work for some of the summer and autumn and is now on 171k. New rear disc, pad and wheel bearings this year, it's a known fact we always get MOT advisories on play in rear bearings, this year was no different but it passed, however when changing the discs the bearings had totally worn out. Rust on the tailgate is getting worse and also in the door bottoms, these are on my list for next year. Absolutely fabulous read, really enjoyed it and love the fact you have owned the car since 96. It's sublime. Keep up the good work mate. The car is tucked up over winter. it's been away since the start of December but i'm really missing driving it which is not helped by the slightly lighter drive home from work and increase in sun and temperature. Back out start of March and I can't wait. It is strange how these cars get under your skin, friends and family think i'm strange but I know all of you understand!